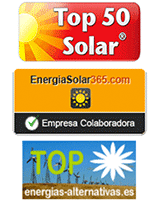 Photovoltaic Solar Kit 250W for self-consumption. Solar Kit consisting of 240Wp solar panel and inverter 250 W. Ideal for beginners in electrical self-consumption, it is a perfectly expandable kit. SAVE OVER € 100 PER YEAR! This solar kit is ideal for beginners in the photovoltaic self-consumption; it is perfectly expandable at any time. · A grid connection microinverter 250W. The self-consumption solar kit is connected to the interior of your home grid (directly into a power outlet if the total power is less than 1000W). The electricity savings you can expect from this solar kit depends on your location, Spain is divided into five climatic zones. The monthly average consumption of a Spanish home is situated at about 300 kWh, so this solar kit can save you about 10% of the annual electricity consumption. The optimal orientation of the PV panel is always facing south and with an inclination of 30º (will vary slightly depending on the exact location). 1. Locate a place of your roof or terrace oriented as possible to the south. Given that should be free of shadows (from other buildings or trees, for example) at least the main hours of sunshine (between 11h and 17h in summer and between 10h and 16h in winter). 2. Once located must choose the right structure for fixing the solar module and microinverter, depending especially if it is a flat roof, like a terrace, or a sloping tiled roof. 3. Prepare the wiring from your nearest outlet to where the panel off. After connecting the output of microinverter this wiring can connect the PV module to microinverter and start generating energy. For a better understanding of the steps follow the microinverter manual. Por fin dimos el paso a usar la energía solar y aunque nos creíamos que iba a ser dificil de montar nosotros solos, que va, con las explicaciones que nos dieron fue fácil.